Eastbourne is often referred to as a ‘gentile seaside resort’, in the past it had a marvellous fleet of dark blue and yellow AEC and Leyland buses that graced its streets. These gave bus enthusiasts whether holiday makers or locals alike many happy memories from a time now long gone by. However, thanks to a group of like minded enthusiasts these memories can be relived in the form of the Eastbourne Buses Classic Bus Running Day 2011. The independent transport videos cameras were on hand to record the event so it can be enjoyed by all. Our day starts early at the Eastbourne railway station, the centre of operations for the day’s events. We see the buses arriving to take up their duties. The year 2011 marks 30 years since the last AEC ran in Eastbourne. Another celebration is that former Eastbourne Corporation Bruce bodied AEC Regent III, 42 (AHC 442) was celebrating its 60th birthday, having spent 40 years in preservation and a mere 20 years in service! AEC Regent V’s numbers 68 and 69 are also present along with Leyland Titan PD2A 72 (BJK 672D) for good measure. Leyland bodied, Leyland Lion LT9 of 1939, 12 (JK 8418) representing an Eastbourne Corporation single decker is also seen operating in service. We also see a number of visiting vehicles from fleets associated with Eastbourne over the years. Bristol VRs, Leyland Nationals, an AEC Reliance to name but a few, as well as some representatives of London Transport, both red and green to add variety to the day. From the station we take a ride via the famous ‘foot of Beachy Head’ on board AEC Regent V 68 now registered KHC 345. The sights and sounds are excellent – you will be taken back in time on this lovely ride along the coast, passing the colourful ‘floral carpet’ along the Grand Parade. After another visit to the station we film along the sea front on Grand Parade and see the former Eastbourne buses and their visitors in service just like it used to be! Back to the station, this time on board Leyland PD2A, 72 (BJK 672D), via the ‘foot of Beachy Head’, enjoying the different sound from this beautifully restored Leyland. We now join 42 (AHC 442) the AEC Regent III and ride via Beachy Head to the pier. This popular bus is well loaded for the journey, remembering what it was like in its heyday. With more filming done on the seafront we make our final return journey to the station on board AEC Regent V, 69 (KHC 369) dating from 1963. 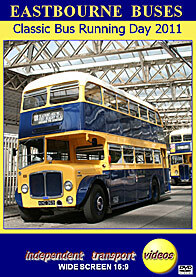 As this bus used to operate the town tour it was fitted with platform doors from new. Our final shots are at the station as the buses return from service for the last time. This video programme really is a journey back in time!